Concerned by what it considers to be a “minimal response” to community feedback from the previous rounds of design review on the project, the Pike Pine Urban Neighborhood Council has come out strongly against the revised plans for the 1020 E Union building as developer Alliance Realty Partners is prepared to bring the massive project in front of the East Design Review Board for the third time Wednesday night. At the core of the objection — another Ankrom Moisan Architects-designed proposal that doesn’t include any schemes for preserving the Davis Hoffman building at 10th and Union despite the project’s planned utilization of incentives that will allow it to stand seven stories tall in exchange for conservation of the neighborhood’s character. “The development team has expressed no interest in the rich character and history of the building,” a letter drafted by PPUNC representatives reads. The full text of the letter and background on the project is below. PPUNC is encouraging its members and the community to speak during the public comment period at Wednesday night’s design review recommendation session and demand a plan that includes preservation of three buildings on the parcels slated for development. Alliance has planned from the start of the project’s path through the design process to preserve the Madison Greetings building at the corner of 11th and E Union. The 44,000 square-foot half-block project will take advantage of the neighborhood’s programs that reward preservation of character structures with the right to build taller, thicker and bigger. After a marathon, three-plus hour session, the board agreed to a compromise — move the process forward to the final “recommendation” stage so the developers can begin important permitting work but make it clear that the next stage is likely to be drawn out as specifics of the project and its developer’s request for building to an extra story of height are banged out. The start of that “drawn out” process comes Wednesday night as Alliance submits its revised plans — embedded below the PPUNC letter. 1. Preserves two valued character structures. 2. Provides pedestrian-friendly functions on the majority all three street facades. 3. Builds a brick building on the SW corner which blends into the neighborhood’shistoric style. 4. Provides a large public plaza at the NW corner. 5. Wider sidewalk with bulb-outs for safety at both corners. 6. Allows small (~700sf ) retailers to inhabit character structure spaces. PPUNC representatives have seen the plan and aren’t satisfied. PPUNC’s complete letter on the project included in the email is below. We are you writing to you again about the Design Proposal for 1020East Union, and ask that you pass this letter along to member of the Design Review Board. We were disappointed with the analysis that was presented at the June 6th EDG meeting, and we hope that this week’s meeting will show a change of direction that includes the integration of the Davis Hoffman building at 10th & Union. PPUNC includes several property owners who have developed our own in-fill and preservation projects, some of whom have development projects in planning now that would use elements of the conservation overlay, and so we speak with first-hand experience that informs the analysis of such sites. We found several elements ofthe development team’s analysis to be weak. 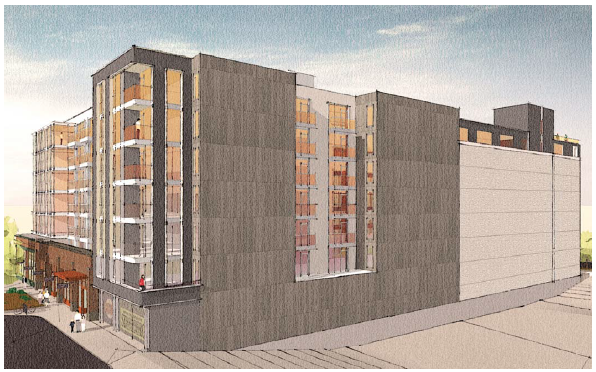 – Those of us with infill development experience on Capitol Hill have routinely shored up adjacent buildings, and while this development team seems to feel that it is a difficult task, it is a common practice for urban infill development. Likewise, many owners in the neighborhood have dealt with structural, seismic, fire damage and rotin older buildings as a routine part of adaptive reuse projects, andAlliance should not have trouble identifying design and engineering professionals with local experience in such projects. – The development team has expressed no interest in the rich character and history of the building. The building’s (unjustified) exclusion from the Department of Neighborhood’s historical resources survey should NOT be the determining factor in its demolition. (Include photos and more narrative about its history – does anyone have this?). – A rough estimate of the value of a rehabbed retail/office project in that location, assuming the very worst case condition (significant structural and energy code work), would require between $2 and $3million in investment and yield a finished value of $7 to $8 million based assuming modest average rents of $25/sf/year. Without knowing the prorated purchase price of the land, we can assume this would leave over $2 million in profit, which could help subsidize the purchase of the other property and the shoring cost involved, in a way that would not be possible if this building were not part of the acquired site. – There are many possible development configurations for the site overall that would yield two 15,000 sf towers, meet the same proposed unit count, and keep all three substantial buildings largely intact.The development team has chosen not to explore these. We can only speculate that it is determined to put a tower on this corner and to meet an internally-prescribed parking count which is likely unnecessary given the proximity to four bus lines and the new streetcar line two blocks away on Broadway. – A rough calculation of the cost and capitalized income value of adding a seventh story of residential apartments to each of two 15,000square foot towers, factoring in the additional cost of Type III construction, yields a profit of close to $4 million dollars. The purpose of the conservation overlay was that this profit would be applied to the preservation and integration of the existing buildings on a site, but Alliance has chosen not to do that with their site,either because they are keeping the profit or because their deal with the seller has them over-paying for the land. In either case, the additional value created by the ordinance is not being used for its intended purpose. Given the proposed minimal façade preservation on two buildings and the outright demolition of the Davis-Hoffman building, the overlay seems to be doing more harm than good on this site. We hope that the development team will work on further alternatives to the site to achieve the win-win outcome that the overlay was intended to achieve.If not, then the DRB and DPD may wish to consider whether, in this case, it is more appropriate to simply deny application of the overlay at all, restrict the project to 65 feet and allow the existing buildings to be demolished. While this is a painful thing to propose,the pasted-on façade elements that are supposed to represent“preservation” in the current plan are an even worse outcome than outright demolition, producing an awful design and setting a very damaging precedent. The long-term owners of nearby properties agreed to a height bonus that in some cases will result in blocked views from their own properties that were developed under the previous zoning.This was agreed to in return for the countervailing value that would be created by keeping the neighborhood’s historic fabric meaningfully intact. However this is not what is happening and so the legality of the overlay, in terms of the currently proposal for this site, must be questioned. egy for preservation instead of imposing a historic district that would take away value from owners and sellers, but that strategy is now being exploited for private profit rather than common good. We ask that the Design Review Board ask the development team to refine its project to preserve the three substantial character buildings on their site in a meaningful way. I agree with the letter and will be there tonight to support Pike Pine. I hope our endlessly creative street artists make use of the vast bleak surfaces of this monstrosity, especially if we lose the ‘community art corner’ at 11th and Pine. Almost any graffiti, posters, stickers, etc. would be a huge improvement for this brute. I can imagine the brick appendage the builder is tossing in to set some sort of faux context. Why does everything have to look as if it was born to grace downtown suburbia? I appreciate what PPUNC is doing here but what is the best way to demonstrate support? I can never come to these meetings. 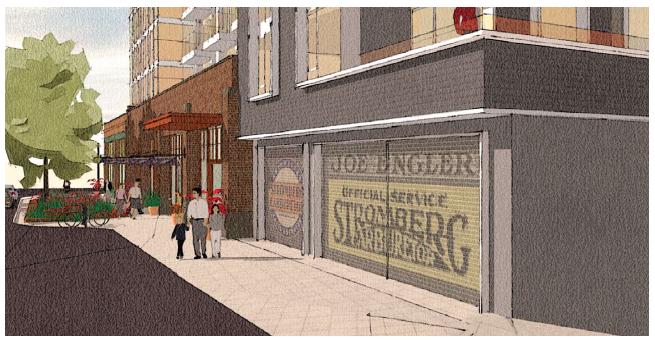 Is that really the rendering the developer has submitted of his proposed building?? That looks like some cold, soviet style building, designed to chill your soul!